MANILA – The largest Korean arms maker has partnered with the Philippines’ top rifle manufacturer United Defense Manufacturing Corporation (UDMC) as part of the strengthened South Korea-Philippines defense cooperation. S&T Motiv, a 45-year-old Korean major firearms manufacturer, and UDMC have recently signed a joint venture agreement signifying mutual partnership and cooperation between Korea and the Philippines. UDMC chairman and CEO Gene Cariño said the objective of the deal is produce for the Philippine military and police force arms that are of “high quality, accuracy and price-competitiveness with the vision of eventually expanding to other markets in the long-term”. "The joint venture agreement demonstrates both our countries’ close mutual cooperation to support the government-level discussions on increasing the bilateral cooperation in the field of defense industry,” Cariño said in a press statement. The Korean Ministry of National Defense and S&T Motiv have presented their line of defense technology products to President Rodrigo Duterte during his official visit to South Korea last June. S&T Motiv is a 45-year-old Korean major firearms manufacturer recognized for its competitiveness in the global market by exporting various firearms to more than 30 countries including Europe, the Middle East and Southeast Asia. “This is truly a beneficial partnership as S&T’s expertise integrated with UDMC’s significant research and development will substantiate the need for increased weapons capability of the Philippines,” Kijoon Yu, President and CEO of S&T Motiv Co., said. Both UDMC and S&T Motiv have joined some 200 local and international ‘exhibitors’ in the “Asian Defense, Security & Crisis Management Exhibition and Conference 2018” (ADAS 2018) held on Sept. 26-28 at the World Trade Center in Pasay City. 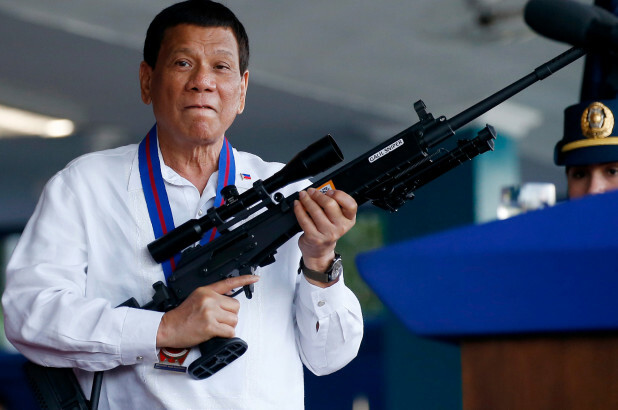 Duterte visited the defense trade show, where officials of UDMC and S&T Motiv showed to him their latest line of accurate and reliable firearms that could meet the demands of the Armed Forces of the Philippines (AFP) modernization program. UDMC is dedicated to the development, manufacture and distribution of assault and precision rifles, and is known particularly for their 5.56 and 7.62 NATO standard rifles used by the military and law enforcers.